Whenever I do little lessons like this with my son , I set them up when he is not around. I introduce them as “puzzles” for him to help me solve and that peaks his interest and makes it fun, not some “lesson” mom is doing cause she misses teaching . Seriously though it is fun because he uses what he calls his “detective skills” to figure out the pattern. 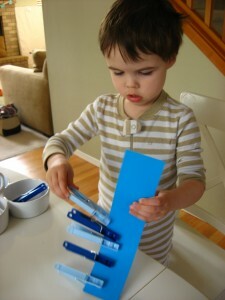 He’s also getting a good fine motor work out pinching them onto the sentence strip. Gather your materials. 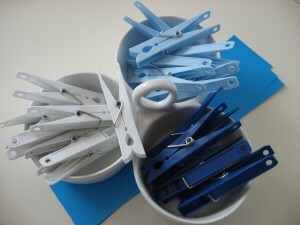 You will need some colored clothes pins. If you don’t have colored ones available, grab the good old wood ones and color them with markers. 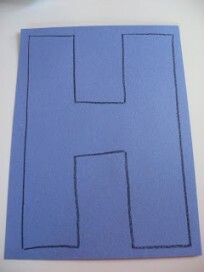 You will also need some stiff paper like cardboard, card stock or sentence strips like we are using. 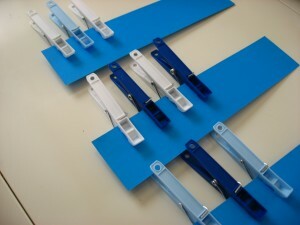 Set out a number of patterns with the clothes pins. I did 3, a general rule of thumb is to provide a challenge but not overwhelm them, or challenge them too much to the point of frustration . I have done patterns before with my son but it had been a while, I also wanted to provide choices for him, something if you have a toddler or preschooler is at times an absolute must have. Give them the pegs and ask them if they can solve the puzzle and figure out what comes next. If they are not sure sing a song ” White , Blue, White , Blue…” that is normally get them going if they are ready for patterns. If an ABABA pattern is too easy try a ABCABC one. Next time we do this I will be doing it with 3 colors in one pattern, my son needed me to sing the pattern for the first strip but them completed the next 2 on fast forward with no input. 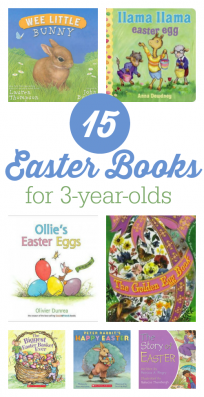 Which tells me next time to make it a little more challenging, but to also provide some at this level to give him a balance of challenge and independent success. Best part – nothing you used gets ruined. 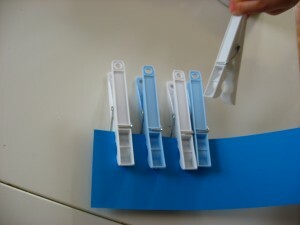 The pins can be used again and so can the sentence strips. 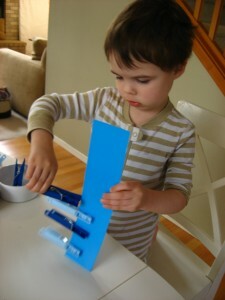 Previous Post: Pretend Play- During Dinner! 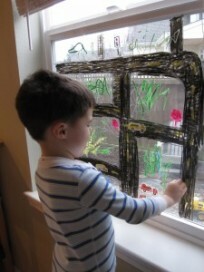 I love how you work/play with your kid!I was an art teacher until my kids were born. So now they are my students in a fun way, like you do! You are so creative, I get every day a little more inspired by you! thank you! .-= gisele´s last blog ..SORTEIO, DE GRATIS, GIVE A WAY, PROMOÃ‡ÃƒO, FREE!!! =-. “not something… because his mom misses teaching.” 🙂 I “miss” it too (well, I graduated quite pregnant so I never actually taught full time but education is my degree). I’m doing a 6-wk substitute job for a friend. We have used some of the songs/fingerplays you posted. “My” preschoolers love them and I had a parent tell me today that her boys are sharing them at home too, which they’ve never done before. Thank you, Allie and know that YOUR teaching talent is still reaching kids in classrooms 🙂 . 1. Yes, I did tell her I found those songs/plays through No Time For Flash Cards. AND, the most-requested, Herman the Worm. We dug up some worms the other day and so I just *had* to teach them the Herman finger play.